A few weeks ago on PracticalEdTech.com I hosted a webinar titled Get Organized With Google Classroom, Calendar, and Keep. 75 people joined that webinar to learn all about the new features of Google Classroom and how they can be used in their classrooms this year. In the last couple of weeks I've heard from many people who wanted to know if I would run the webinar again. 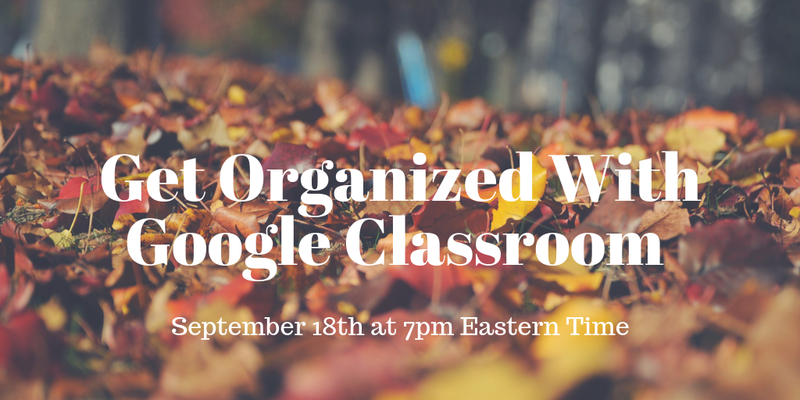 So by popular demand on September 18th at 7pm ET I'm hosting an encore presentation of Get Organized With Google Classroom, Calendar, and Keep. In this live webinar on September 18th at 7pm ET you will learn what’s new in Google Classroom, what’s changed, and how you can use Google Classroom to stay organized throughout the school year. In this webinar you’ll also learn how to use Google Calendar and Google Keep to organize and maintain your schedule in the new school year. 1. How to streamline your workflow through Google Classroom. 2. How to organize and share resources with students. 3. How to keep track of goals (yours and your students’) through Google Keep and Calendar. 4. How to manage multiple course calendars without losing your mind. 5. How to streamline meetings and meeting scheduling. This webinar will be recorded for those who register but cannot attend the live broadcast. Everyone who registers will be sent a copy of the recording of the live webinar.